Bonding with your baby isn’t always smooth sailing. There is an expectation among many women that as soon as the baby is laid on her chest, their attachment to one another will be firm and powerful. The truth is, there are a LOT of variables at play: the mother’s neurology and hormones, the child’s physical illnesses or surprises, delivery complications, etc. There are a lot of things that can get in the way of a mother’s “typical” attachment trajectory. It can’t be stated enough just how normal (read: A-Okay) that is. Exploring your expectations is an important way to be prepared for birth and the following months. It is also wise to come to birth prepared to be proactive about your attachment experience. Don’t just wait for magic to happen - take hold and make it happen! I dive into expectation exploration in my eCourse for expecting parents here - but you can also download my FREE PREGNANCY CHECKLIST here (or by clicking below) and get started quickly. Loving your baby will be one of your life’s greatest adventures, but some women have to surmount a few obstacles. 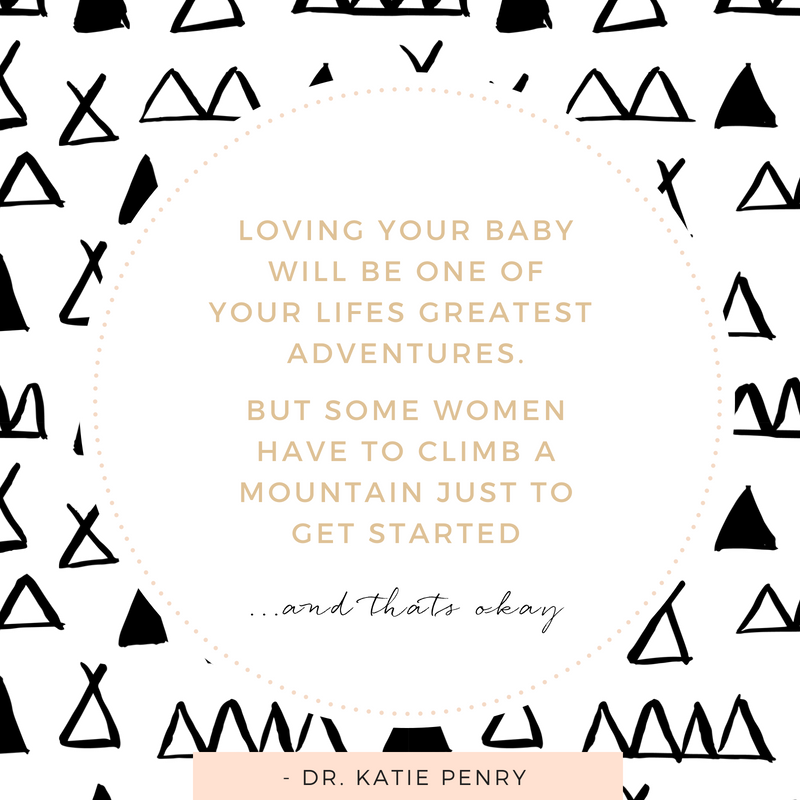 Preparing for these obstacles is tantamount, but if you’re already on the other side, looking at your baby with longing (and maybe a little confusion), then READ ON! I have 10 ways that will build your bond and bring you together! Take that shirt off and undo that onesie. Skin to skin is not just something that the hippies drone on and on about. Skin to skin has some serious brain boosting, love boosting science behind it. If you can’t find a time to do skin to skin, do it right after the baby has eaten. When your baby is in that floppy “milk drunk” state, his happy hormones are flowing and he is ready to attribute that feeling to your loving relationship. Get the other parent in on the action too - there’s magic in skin to skin. If you’re feeding your baby with a bottle, cradle your baby against the breast or put her feet on your belly, head on your knees to feed her. You want to make sure that you're in that optimal place for her to catch your gaze, notice your face, and appreciate the contours of your face while she feeds. For most babies, it is about 10 inches, but don't hold me to it! It may be a little closer or a little further for you. I don’t have to tell you to stay awake, be safe, and (optimally) have a partner help you. But for the first several months, plan to skip the baby sink and bathe your baby on your chest, in the bathtub…..together. Take deep breaths, relax together, and allow your baby to experience you and your body in a relaxed state. You would be surprised to know how intuitive a baby really is when it comes to the energy and fluidity of the mother's body. Don’t let this make you more anxious. Rather, use it as a reminder that when you are feeling tense across your chest and back and in your breath, take a beat. Make sure that tub time is outside of time constraints, outside of diet, and outside all expectations. What I mean by that is simple: if you schedule bathtime (I recommend it) make whatever happens in there just be completely baby and mama lead. Your baby needs a moment of physical comfort, and sweet togetherness with you - sans expectations. Listen to yourself and your baby’s needs. It is only 10 or 15 minutes. If your baby feels like snacking at the breast, let him. If your baby feels like being alert and working on his strength, let him. If he wants to doze...who cares! Facilitate his exploration and use of your time together in a relaxed state. Babies are more likely to bond with people that respond to them appropriately. When they are very young (0-3 months especially) this means picking them up when they cry, helping them soothe and sleep, feeding them regularly. Referencing suggestion number 5, it helps if you know a few things about your baby that can help you determine the best way to respond to their needs. So don’t miss my blog post about baby communication. It also helps if you have several soothing techniques in your back pocket. Relying on one way of soothing is a handicap because your baby will respond to different interventions differently at different times. Have an array of things to offer her. Sometimes, bonding is absolutely happening for the baby. The mother is taking the right steps, being responsive, and the baby is totally feeling madly in love and connected. The mother on the other hand, doesn’t feel the same way. Don't freaking sweat it >> We will get you there! Remember, all babies need someone that is madly in love with them. If you’re struggling to find moments of joy and a feeling of connection with your baby because of mood problems, then by all means >> seek help. There ain't no shame in that game. Speak to a doctor about your feelings of detachment. There are medications that help tremendously. Your doctor can also help you determine if the mood lability is a result of sleep deprivation or exhaustion. If this is the case, then the doctor might be able to help you establish connections with your community, babysitters….or other folks that can act as a pinch hitter and give you some REST. We tend to neglect ourselves….but you can’t keep giving without ever receiving. Believe it or not, babies are happiest when the mother is well taken care of…. Have you taken my Lookup Challenge yet? Being an attuned caregiver is absolutely critical. Noticing the nuanced, nonverbal communications of an infant isn’t automatic - it requires some of your sustained attention. This sustained attention is become harder and harder as parents become more distracted by social media. If you haven’t take the LUC, I really encourage you to do so now. It is only 7 days, 7 emails, and it will help you establish safe, smart media-use habits that will change your life. Already taken the #lookupchallenge but wondering where to start in your observations? Start with her micromovements. How does she hold her hands. I always tell moms, "if you were to write a descriptive essay about your baby, what would you notice, what would you say?" As you become familiar with these sweet small things, work your way up to actually listening to her cry and learning the different communications hidden within the different cries. Didn’t know that baby’s had different cries? Then this article here is for you. Do you have to wear your baby for attachment to happen? No. But is it awesome for attachment? Yes. Give your relationship with your baby and your experience of her a boost by strapping her to you with a baby carrier. You can find some beautiful options for baby carriers and wraps here: Purple Elm Baby. Babywearing has physiological benefits as well. It is great for muscle tone, communication skills, and sleeping. If attachment is slow to come, it is okay. Take deep breaths and practice the above steps. Meditate on your excellence and all the ways that you have put your love in action thus far. Notice that you are good-enough and doing a great job. During moments of prayer, imagine where you would like your relationship with your baby to be. The more thorough your imaginings, the longer that you sit with these, the more quickly they will become manifest in your life. Meditations and prayers based in your hopeful imaginations, yet grounded in reality, will be a powerful tool as you continue to reach for your great potential as a parent.